↑ "WHO Nipah Virus (NiV) Infection". www.who.int. 18 April 2018 के ओरिजनल से पुरालेखित. पहुँचतिथी 21 May 2018. ↑ 2.0 2.1 "Nipah Virus (NiV) CDC". www.cdc.gov (English में). CDC. 16 December 2017 के ओरिजनल से पुरालेखित. पहुँचतिथी 21 May 2018. ↑ Broder, Christopher C.; Xu, Kai; Nikolov, Dimitar B.; Zhu, Zhongyu; Dimitrov, Dimiter S.; Middleton, Deborah; Pallister, Jackie; Geisbert, Thomas W.; Bossart, Katharine N.; Wang, Lin-Fa (अक्टूबर 2013). "A treatment for and vaccine against the deadly Hendra and Nipah viruses". Antiviral Research (English में). 100 (1): 8–13. doi:10.1016/j.antiviral.2013.06.012. ISSN 0166-3542. पहुँचतिथी 21 May 2018. ↑ 4.0 4.1 "Nipah virus outbreaks in the WHO South-East Asia Region". South-East Asia Regional Office. WHO. पहुँचतिथी 23 May 2018. ↑ Luby, Stephen P.; Hossain, M. Jahangir; Gurley, Emily S.; Ahmed, Be-Nazir; Banu, Shakila; Khan, Salah Uddin; Homaira, Nusrat; Rota, Paul A.; Rollin, Pierre E.; Comer, James A.; Kenah, Eben; Ksiazek, Thomas G.; Rahman, Mahmudur (2009). "Recurrent Zoonotic Transmission of Nipah Virus into Humans, Bangladesh, 2001–2007". Emerging Infectious Diseases. 15 (8): 1229–1235. doi:10.3201/eid1508.081237. ISSN 1080-6040. PMC 2815955. 22 May 2018 के ओरिजनल से पुरालेखित. ↑ Luby, Stephen P.; Gurley, Emily S.; Hossain, M. Jahangir (2012). TRANSMISSION OF HUMAN INFECTION WITH NIPAH VIRUS (English में). National Academies Press (US). 22 May 2018 के ओरिजनल से पुरालेखित. पहुँचतिथी 21 May 2018. ↑ Eaton, BT; Broder, CC; Middleton, D; Wang, LF (January 2006). "Hendra and Nipah viruses: different and dangerous". Nature reviews. Microbiology. 4 (1): 23–35. doi:10.1038/nrmicro1323. PMID 16357858. ↑ 10.0 10.1 Chadha MS, Comer JA, Lowe L (2006). "Nipah virus-associated encephalitis outbreak, Siliguri, India". Emerging Infectious Diseases. 12 (2): 235–40. doi:10.3201/eid1202.051247. PMC 3373078. PMID 16494748. 29 जून 2011 के ओरिजनल से पुरालेखित. ↑ 11.0 11.1 Hsu VP, Hossain MJ, Parashar UD (2004). 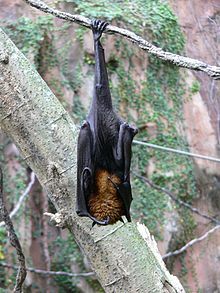 "Nipah virus encephalitis reemergence, Bangladesh". Emerging Infectious Diseases. 10 (12): 2082–7. doi:10.3201/eid1012.040701. PMC 3323384. PMID 15663842. 11 April 2011 के ओरिजनल से पुरालेखित. ↑ "Arguments in Bahodderhat murder case begin". The Daily Star. 18 मार्च 2008. 24 अक्टूबर 2012 के ओरिजनल से पुरालेखित. पहुँचतिथी 21 May 2014. ↑ Bever, Lindsey (2018-05-22). "Rare, brain-damaging virus spreads panic in India as death toll rises". Washington Post (English में). ISSN 0190-8286. पहुँचतिथी 2018-05-23. ↑ "Lini Puthussery: India's 'hero' nurse who died battling Nipah virus". BBC News. पहुँचतिथी 22 May 2018. ↑ hermesauto (2018-05-22). "Rare brain-damaging Nipah virus kills 10 in India, prompts rush to hospitals". The Straits Times (English में). पहुँचतिथी 2018-05-23.